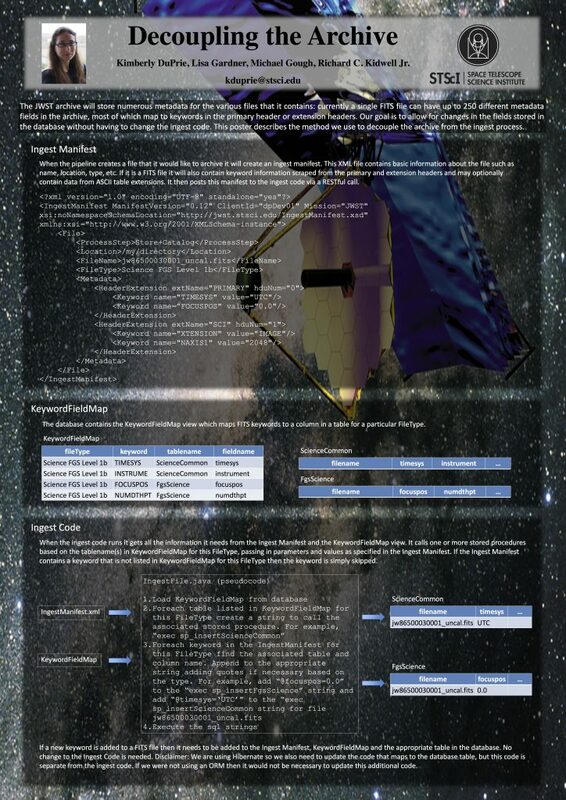 The Astrophysics Source Code Library (ASCL), established in 1999, is a citable online registry of source codes used in research that are available for download; the ASCL’s main purpose is to improve the transparency, reproducibility, and falsifiability of research. This presentation discusses the 2017 improvements to the resource, including real-time data backup for submissions and newly-published entries, improved cross-matching of research papers with software entries in ADS, and the expansion of preferred citation information for the software in the ASCL. This entry was posted in ADASS, conferences, poster, presentations on October 23, 2017 by Alice Allen. On Tuesday at ADASS, ASCL Advisory Committee Chair Peter Teuben led a Birds of a Feather session intended as a working session to have people put some of the ideas for improving software citation and credit into practice. He opened the session with a few remarks about last year’s BoF, similar efforts elsewhere, and examples of progress since last year. Yes, there has been progress! He then showed a list of actionable items and asked people to work on them, adding their work to a common Google doc. His slides are here. And they did! It was the quietest BoF ever, I believe, as Keith Shortridge, Bruce Berriman, and Jessica Mink wrote about their experiences in releasing software; Renato Callado Borges and Greg Sleap provided guidance on the types of software contributions that add value to science; Alberto Accomazzi, Nuria Lorente, and Kai Polsterer listed ways one can publish and take credit for software; Peter Teuben, Steven Crawford, and possibly others pulled together a list of organization web pages about software created at the institutions, this as a way to highlight and recognize scientific software contributions; Maurizio Tomasi added a suggestion for gathering licensing information; and Thomas Robitaille, Ole Streicher, Tim Jenness, Kimberly DuPrie, and I discussed exactly what should be in the “Preferred citation field” of the ASCL and various people listed about a dozen preferred citations to be added to the ASCL and others used the Suggest a change or addition link for several software packages to provide preferred citation information. Though Peter had asked that people work for about 30 minutes, he monitored contributions to the Google doc and saw work was still being done so did not call us back together until only 15 minutes or so were left in the session. Instead of having people report back on what they had done as originally plan, he asked for other feedback instead, as progress made was evident in the shared document, and after a bit of discussion on licensing and a few other comments, closed the session. Though the session is over, the next phase is to put this information to use or disseminate it in some way so it can do some good and be the changes we want to see for software! This entry was posted in ADASS, codes, conferences, ideas, presentations on October 22, 2016 by Alice Allen. The James Webb Space Telescope (JWST) archive will store numerous metadata for the various files that it contains: at the time of this writing a single FITS file can have up to 250 different metadata fields in the archive, most of which map to keywords in the primary header or header extensions. One of the goals of the archive design is to allow for changes to the fields stored in the database without having to change the ingest code. We have found this to be very helpful during the code development phase of the mission when the FITS file definitions are frequently changing. We also anticipate it will be advantageous during the lifetime of the mission as changes to processing will likely result in changes to the keywords but should not require changes to the ingest code. This poster describes the methods we use to decouple the archive from the ingest process. This entry was posted in ADASS, poster, presentations on October 19, 2016 by Alice Allen. 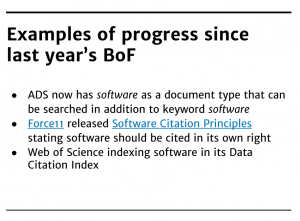 The Implementing Ideas for Improving Software Citation and Credit BoF is intended to be a working session to put ideas already generated into action! Everyone in the community has a role in improving it. We have listed a lot of ideas in the previous post about this BoF, have slides online here, and a Google doc to which you can contribute here. This entry was posted in ADASS, conferences, ideas on October 18, 2016 by Alice Allen. 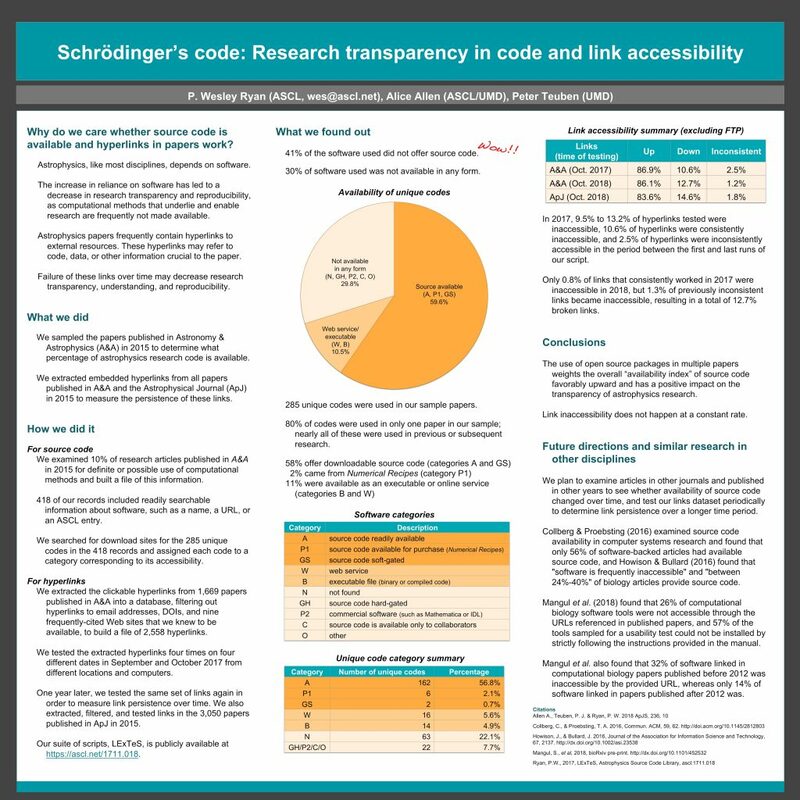 We want to share some of the posters that are appearing at ADASS this week (with permission of their authors). 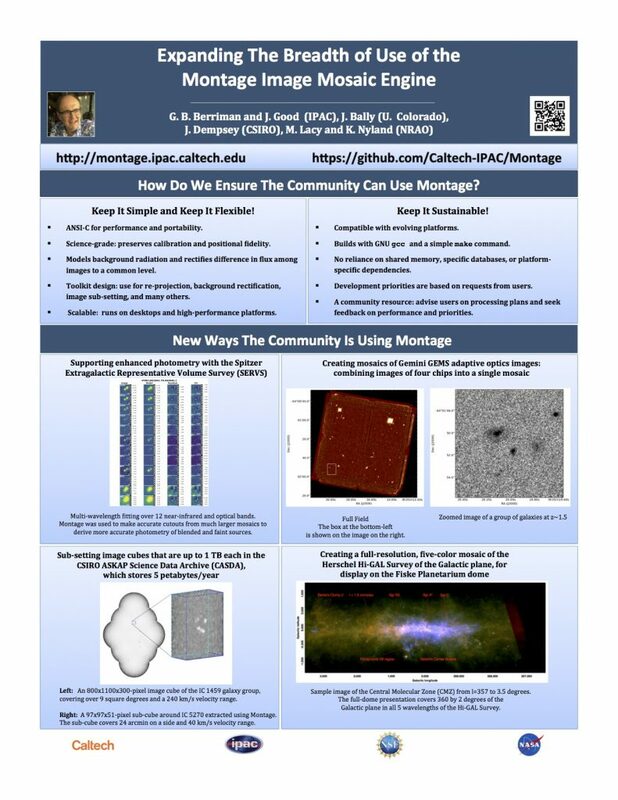 Montage is in the ASCL; we love this poster for several reasons, but especially because it makes clear that sustainability of the software is important! – Visualization of complex images with data overlays: e.g. as a re-projection engine integrated into the server-side architecture of a Gbit visualization system supporting investigations of 3D printing with the X3D protocol creation of sky coverage maps for missions and projects bulk creation of sub-images of multiband photometry data creation of plots in the APLPy library. – As a re-projection engine to support discovery of 86 Near Earth Asteroids (a U.S. congressional mandate) in the Lincoln Near-Earth Asteroid Research Program (LINEAR). – Integration into data processing environments: integration of the 4D image cutout tool into the VO-compliant CSIRO ASKAP Science Data Archive (CASDA) as a re-projection engine for the Dark Energy Survey (DES) pipeline. – Discovery of imaging data at scale: use of memory mapped R-tree indices to support searches for spatially extended data, in use in Spitzer and WISE image searches and in spatial and temporal searches for WISE and KOA. It has been cited as an exemplar application for development of next generation cyber-infrastructure in 238 papers between 2014 and 2016 to date. What has enabled this broad take-up is that Montage has been built and managed as a scalable toolkit, written in C and portable across all common *nix platforms, with minimal dependencies on third-party software, such that it can be built with a simple “make” command. All the components have proven powerful general-purpose tools in their own right, even those first developed to support mosaic creation, such as discovery of images for input to the engine and for management of mosaics. We describe how Montage is managed to assure that the benefits of the architecture are retained, and how we ensure that new development is driven by the needs of the community. This entry was posted in ADASS, codes, poster, presentations on October 17, 2016 by Alice Allen. 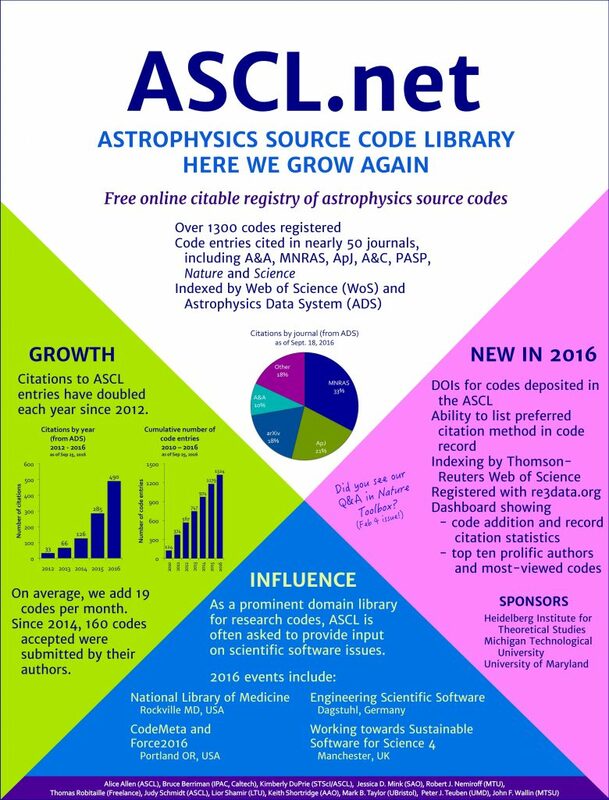 The Astrophysics Source Code Library (ASCL) is a free online registry of codes used in research; it is indexed by ADS and Web of Science and has over 1300 code entries. 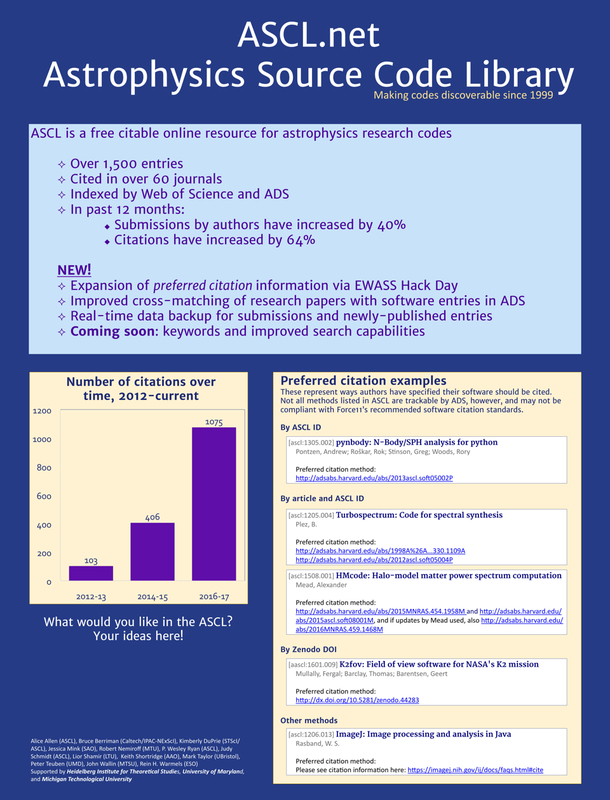 Its entries are increasingly used to cite software; citations have been at least doubling each year since 2012, and every major astronomy journal accepts citations to the ASCL. Codes in the resource cover all aspects of astrophysics research and many programming languages are represented. In the past year, the ASCL has added dashboards for users and administrators, started minting DOIs for codes it houses, and added metadata fields requested by users. This presentation covers the ASCL’s growth in the past year and the opportunities afforded to it as one of the few domain libraries for science research codes, and will solicit ideas for new features. This entry was posted in ADASS, poster, presentations on October 17, 2016 by Alice Allen. Page rendered in 0.399 seconds. Blog powered by WordPress.